Arkansas is a complex place—part Old South, part Old West, and part traditional hill country—that has shared an amazing array of people and products with the world. Even so, much of what makes Arkansas so special remains largely unrecognized. Arkansas Backstories highlights the lesser-known aspects of America’s twenty-fifth state. The short essays in this handsomely illustrated book will offer surprises for even the most dedicated and devoted students of the state. How many readers, for instance, realize that the first sitting member of Congress to be assassinated was shot to death in Monroe County? Or that the CIA had secret contracts with an Arkansas organization to train animals for clandestine activities? Or that there’s good evidence that Abraham Lincoln lived for a time in northeast Arkansas, chopping wood for a plantation owner? Few readers may be aware of the connections between Arkansas and the Texas fight for independence. Or that baseball’s spring training routine originally began in Hot Springs. Or that Arkansas is the country’s leading producer of goldfish. Or that the state’s capital city was once known as Arkopolis. 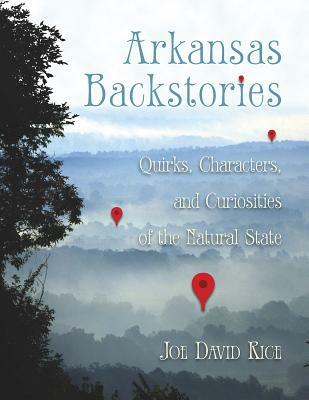 These and other captivating topics are what make Arkansas Backstories an essential addition to every coffee table in the state. The book will delight any and all interested in Arkansas—one of the nation’s most fascinating states. The companion to this book—Arkansas Backstories, Volume 2—will be published by Butler Center Books in the spring of 2019.